This soup is chicken broth that is colored pink by ancho chiles. Its charm lies in the manner in which it is served: You place matchstick vegetables in the bottom of the soup dish and then ladle the hot soup on top of the raw vegetables. Squash blossoms are the flowers produced by both winter and summer squash. They are very fragile and limp and easily opened and stuffed with goat cheese. Squash blossoms are available year round in specialty produce markets as well as in Italian and Latin American food stores. If squash blossoms normally are not available in your market, they may be ordered through the produce manager. If you have access to a garden, harvest your own that morning. You can cut the vegetables into matchsticks about 1/8 inch in size, using a sharp knife, food processor, or mandoline. Rinse and dry the chiles. Slit lengthwise and remove and discard the seeds. Place the chiles in a dry skillet. Toast them over medium heat, flattening the chiles with the back of a spatula and turning them several times. Watch carefully as they can burn quickly. Remove and coarsely chop. Pour the broth into a medium saucepan and place over medium heat. Add the chiles and simmer the broth until it is rose colored, about 20 minutes or so. The longer the anchos steep in the broth, the darker and spicier the broth will be. Strain the broth, remove and discard the chiles, and return to the saucepan. Set aside. Heat the oil in a small skillet. Add the garlic and mushrooms and sauté until tender. Remove from heat and set aside to cool. Toss with raw squash, zucchini, and carrots when cooled. Open the squash blossoms gently and remove the yellow stamen. Fill each blossom with 1 to 2 teaspoons of the goat cheese. If squash blossoms are out of the question, the goat cheese can be formed into little 1-inch balls and rolled in minced parsley to coat them. To serve, reheat the broth. Divide the julienned vegetables and place in 4 large, flat soup bowls. 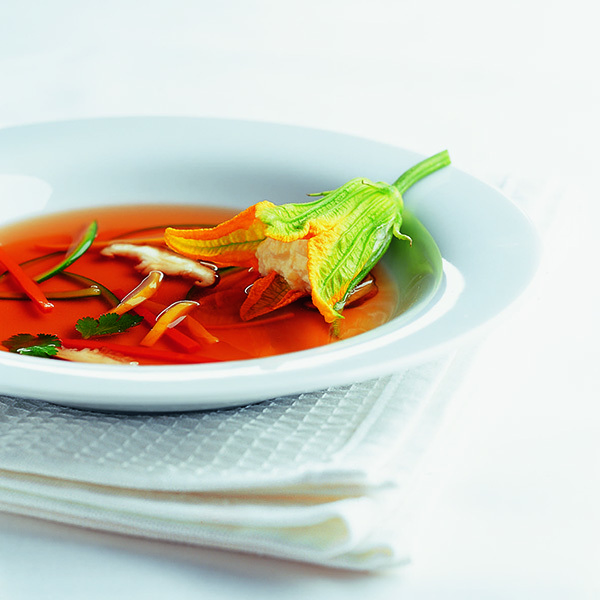 Ladle the broth over the vegetables and float squash blossoms on top or set the ball of goat cheese on last. Garnish with cilantro leaves.